Champions League football #betting odds, predictions and fantasy picks for this week's matches. The Champions League quarterfinals are when it really gets serious in Europe's top competition. So too should your bets. That's why you should let us help you pick out some potential value from the upcoming matches on Tuesday and Wednesday, April 11 and 12. 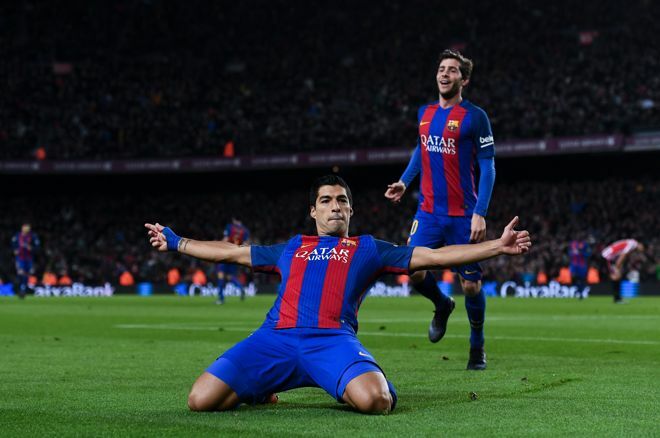 Barcelona will be breathing a sigh of relief having got this far - the last-16 win over Paris Saint Germain was earned the hard way, with a 4-0 drubbing being beaten by a 6-1 win at Camp Nou that defied belief and made people think that this could be the team that wins the Champions League. Juventus might have huge success in Europe to its name, but on the scheme of things it goes into this two-legged match-up looking a bit like an underdog. However, Barca showed at the weekend with a 2-0 defeat to Malaga that it's possible for a strongly-organised team to beat the Catalans. You'll find good value in betting on Juve, especially with an almost clean injury list. This is an enormously intriguing match-up between two teams that both have legitimate reasons to believe they can get to the semi-finals. Monaco warmed up for this match with an expected 1-0 win over Angers in Ligue 1, and though the team misses Djibril Sidibe (injured) and Tiemoue Bakayoko (banned), striker Radamel Falcao is among a squad of players on top form right now. As Monaco was good enough (at the expense of several cheap goals) to knock out Manchester City, everyone should beware. Dortmund will certainly watch out, after a 4-1 weekend defeat to Bayern Munich in the Bundesliga. This game might suit Thomas Tuchel's high-pressing side better - but to win, Dortmund will need to take a lead to Monaco. Expect a narrow Dortmund win, or a scoring draw. With Bayern once again running away with the Bundesliga, attentions can be fully-focused to the obsession of winning the Champions League. Carlo Ancelotti is the only manager to win the trophy three times, and he will know better than anyone else how to balance the pressures of tournament football. Bayern misses key players Mats Hummels and Manuel Neuer (the goalkeeper a particularly huge loss) with injury. Real Madrid manager Zinedine Zidane worked under Ancelotti when the Italian was manager at the club, and likes to play in a similar, front-foot, attacking manner; Real will have to do so without defensive anchor Pepe. That will suit Bayern, with a bang-on-form Arjen Robben and Frank Ribery part of a team that is able to outsmart even the most star-studded line-up. Leicester City fans were probably hoping for another team than Atletico, with Diego Simeone's counter-attacking masters arguably using the tactical tricks that won the Premier League for the Foxes, but to even better effect. Even though Atletico has a lengthy injury list, Antoine Griezmann is fit to play, a frightening prospect for a Leicester defence missing Wes Morgan. This will probably be where the Leicester European dream comes to an end, but as we've seen before, anything can happen when the English champion side is on its game.